The last farewell to Don John Olin Brown. Monday, August 22, 2016, in the Parish of Mater Gratiae, Oasis of Nazareth in Corato the last farewell was given to don John Olin Brown. His funeral rite was presided by His Excellency Archbishop Giovan Battista Pichierri, with the presence of Mons. Savino Giannotti, Vicar General of the Archdiocese and part of the diocesan clergy. He was born in 1952 in a small town near Dallas, Texas. He graduated in philosophy in 1974. He came from a family that was rooted in the Evangelical Church. He had a brother and an aunt who were Pastors of the Methodist Church. His family was considered sufficiently religious. In his country there was not even a Catholic Church, and he never supposed he could to convert to Catholicism. He received a very rigid moral education from his father. Since he was a child, he felt a special attraction to the Lord, however his vocation, developed over time. After being admitted to the university, he began to feel more strongly the vocational problem and he tried to focus on the philosophical study thinking that in the future he could become involved in the Methodist Church. Meanwhile, he postponed his choice and went back to the "ranch" to work with his father as a cowboy. After his father's death he felt free to go back to that "fixed idea" of a God that was tormenting him. During a vacation in Minnesota he met a Jesuit priest who fascinated him with his speech on the Catholic Church, he remained with him for a long period of time, after which he converted to Catholicism. Since he was attracted by the monastic life he lived for a year at a Trappist monastery in Iowa. At that time he learned about the writings of Luisa Piccarreta well known in America, Canada and Mexico, and they were as a completion of his conversion. Therefore, he come to Italy, he arrived in Corato to visit the Association of Luisa, where he was welcomed by President Sister Assunta Marigliano and the Ordinary of the place, Mons.. Giuseppe Carata who suggested him to finish his theological studies he had begun in Rome. The writings of Luisa, full of high spirituality, managed to give him an existential response that he was unable to find either in philosophy or in several Catholic spiritual currents. His stay in Corato coincided with the period in which the association got, thanks to His Excellency Archbishop Mons. Carmelo Cassati the "non obstare" from the Sacred Congregation for the Causes of Saints to open the process of the Cause for the Beatification of the Servant of God Luisa Piccarreta..
At Corato, he was amazed at the lack of knowledge by people about the figure of Luisa that instead was well known abroad and, at the same time, he was impressed by the generosity and affection of the people of Corato. He considered himself fortunate to have been formed in the priesthood in the spirituality of Luisa, because what the Servant of God did in her life, embraced and embraces the spirituality of all priests : sanctify themselves for the Kingdom of God. This was also the yearning that Don John always had. The archbishop recalled that during a talk he had this year with Don John on his return, he felt in his heart Don John’s great desire not to "fly" over and to stay forever in the land of Luisa Piccarreta, the little creature, the littlest among all people of Corato, towards whom he felt a deep gratitude. Due to a severe lung infection he was hospitalized at first in the hospital of Corato and then in Trani, in intensive care, where he died. He became a priest in Trani, and he died in Trani on August 20. 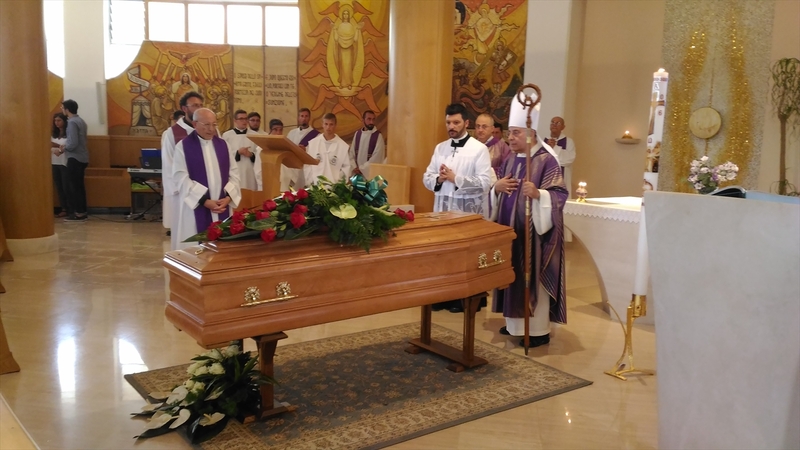 The Archbishop pointed out that for our Diocese, welcoming the mortal remains of father John is to be considered a special grace because it allows us to accomplish one of the corporal works of mercy: to bury the dead. The archbishop also reiterated that the Diocese undertook to establish contacts with his native land, speaking with some of his relatives who immediately expressed their wish to have him there, but given the bureaucratic hurdles and Don John’s desire to stay in the land of Luisa, it was decided to bury him in the cemetery of Corato. The Archbishop stated: "For me, Father John is a beautiful testimony on the Servant of God Luisa Piccarreta, we must therefore be able to preserve the memory of this priest non only as priests, but also as people." Don John was no longer the handsome giant of the early days, now he appeared meek as a lamb, always able to say thanks to all those people who approached him to help him. His conversion is the fruit of the love of God, a God that John had found in the Catholic Church, he served as a priest the Church and announced the Kingdom. Then, the Archbishop exhorted the brothers priests to serve with joy the people that Christ has entrusted to them to walk together towards the eternal Kingdom, that Kingdom where the first creature who was assumed into Heaven has become the Queen of Heaven and earth with our King Jesus Christ. Don Jon felt this intensely, since he had begun to follow the little daughter of the Divine Will. Let’s pray that he will be received by the Father and could be considered a small son of the Divine Will. Jesus says ”the children of the Kingdom of the Divine Will will be those that will render Her the honors of Queen and transforming themselves into suns they will form for Her the most beautiful crown” , may also Don John offer his life turned into sun as a proof of honor and glory. It is very remarkable that his funeral was celebrated on the day in which the liturgical calendar of the Church commemorates the Blessed Virgin Mary, invoked under the title of Queen. As each soul enters into Heaven through Mary and by virtue of her motherhood and her pain, we hope that the Blessed Virgin welcomed him and handed over to her Son. After the Mass, in an atmosphere of sadness and feelings shared by all, the coffin, which was carried on the shoulders by some brothers priests was placed in the hearse.